Pretty, leafy, green Glen Echo Ravine seems an unlikely spot for a gateway to the nether regions but that's what local folklore holds. Glen Echo is one of several steep-sided ravines carved by streams running down to the Olentangy River from the higher land to the east. The ravine cuts through the clay and glacial debris deposited by the last ice age and digs deep through the shale strata that lies beneath. The ravine is about 50 foot deep. In 1912, a real estate compant bequeathed some of the land in the ravine to the city for use as a public park. The modest park runs from the railroad tracks down to the Indianola Bridge. The land to the west of the bridge is mostly owned by Columbus City Schools although small sections are owned by home-owners and businesses. Due to the depth and steep sides of the ravine, its heavy forest cover, its relative inaccessibility to law enforcement, and its status as a tributary of the Olentangy River, trespassing through the ravine is common. The first part of the walk--from the Indianola Bridge to the Calumet Bridge--is difficult. The terrain is rough and uneven, Gravel and loose shale are underfoot. One must pass over or around huge glacial erratic boulders that have washed down here over the milennia. Depending on the weather, the stream may or may not be flowing. If it is flowing, the explorer must wade across thigh-deep pools or try to climb the muddy stream banks to get around them. One must frequently clamber over or under fallen trees and through heavy brush. In the summer, there are stinging nettles to avoid. After the Calumet Bridge, the ground is scoured and smooth. One walks on shale bedrock, mostly clear of gravel and debris. It's almost like a highway. At the bottom of the ravine is a huge cage of steel beams before a dark tunnel entrance. This is the purported Hellmouth. The steelwork was installed there to keep trees and other large debris from obstructing the drain but it gives the area a sinister cast. The tunnel goes beneath High St. and is big enough for a man to stand in. It is pitch black inside. The tunnel makes two bends. Every inch of the walls is covered with graffiti–some of it esoteric. The sound of metal scraping against metal can often be heard echoing from within. It sounds like a heavy iron door swining on rusty hinges. Though surrounded by some of the most densely populated neighborhoods in the city, the deep, shady, and heavily wooded ravine leading down to the “gates” feels like it’s a thousand miles away from the rest of the world. Steep ravine walls mean the only way in is also the only way out. Maybe that's the inspiration for the stories they tell about the ravine. Another story talks of a death in the tunnel itself. The concrete area near the Gates is popular with skateboarders. They call it "The Blood Bowl." 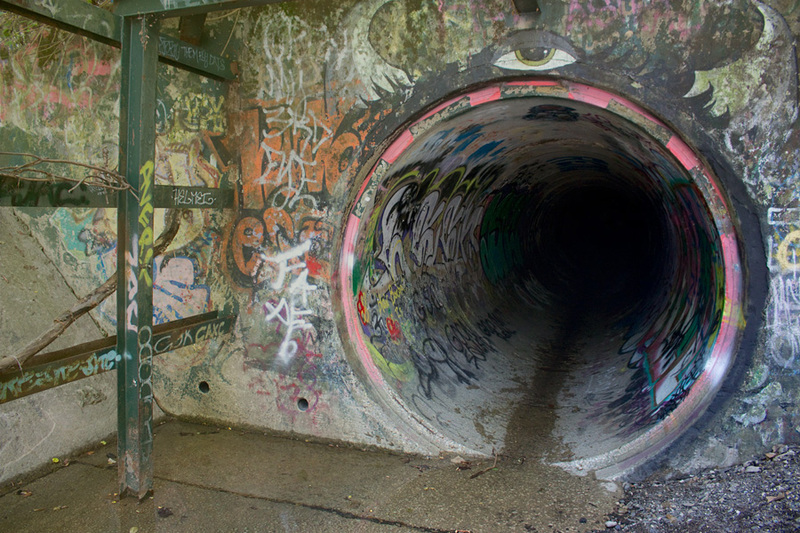 Supposedly a few years back, a skater had the idea to skate the length of the tunnel in the dark. He never made it to the other side. The skater was found dead part way through the tunnel, with his skull caved-in. His spectre is said to haunt the inky depths of the tunnel, forever looking for the way out. No records corroborate this tale. In 1988, a scenes for a direct-to-video horror movie were filmed in the ravine. Beyond Dream's Door told the story of a troubled young man whose nightmares come to life as something from beyond pursues him in the waking world. The hero of the film flees his nightmares through a haunted dreamscape and meets his own doppelganger and an evil dream temptress in the tunnel. 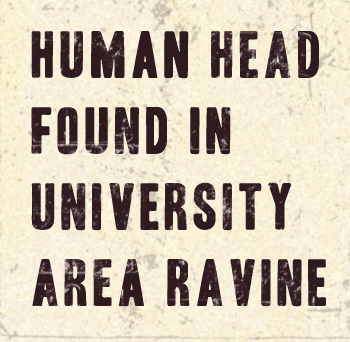 In November 2001, something particularly strange showed up in the ravine: a human head. A couple walking through the ravine noticed what lookd like a skull near the path through the ravine. At first, they thought it was some prop left over from Halloween but closer inspection proved it authentic. The police were called and an investigation began. The head was old and mostly skeletonized. Mostly but not completely. It still had hair, coiffed and held in place with a rusty metal barret. Bits of flesh still clung to the bone here and there. An anthropologist from Ohio State was called in and determined the skull was female and of a woman of late middle age. The skull seemed to have been buried and then exhumed. A search of Union Cemetery across the river discovered no disturbed graves. A review of historical maps showed no pioneer graves that might've been disturbed by erosion. Apparently, someone had exhumed a skull from a grave and deposited it in the ravine. Nothing more was ever determined. Whose head was it? Why was it in the ravine? Who brought it there and what purpose did they intend for it? In 2005, the Gates of Hell were featured in Loren Coleman, Andrew Henderson, and James Willis' book Weird Ohio. The books were part of a series chronicling the strange places of various U.S. states and regions. The Gates were listed alongside Hangar 18, the Franklin Castle, and Gore Orphanage as one of the Buckeye State's outré attractions. In autumn 2016, mystery clowns were popping up all over the US, Canada, and Britain. Siniser clowns were sighted standing along rural highways, lurking on dark city streets, and wandering through parks with no circus near. One must have strolled up from the Gates of Hell. A teenage girl was chased by a knife-wielding evil clown near the old North High School which sits on the banks overlooking the ravine. The most interesting story about the ravine claims that it hides a secret Hellmouth, a hidden gateway to the infernal regions. Most of the time, the drain is just a drain but on certain nights when the stars are right, a gate opens there to realms beyond. For brief intervals, creatures and things can pass between realities. The portal is variously said to have been opened by occult-dabbling hippies in the Seventies or devil-worshipping, heavy metal teens in the Eighties. The Hellmouth can be opened intentionally or accidentally. It can be thrown wide or opened just a crack. Whether wide or narrow, nature abhors their opening and they slam shut quickly. Things on the other side of the gates are hungry for the flesh and blood of what lives on this side. Unless bound and enjoined by powerful magics, they will grab the first victim(s) they see and drag them bodily into the abyss. There are said to be ritually significant places and objects scattered along the path to the "gates." Acts and invocations performed in sequence at these places or to these objects are part of the rite to open the gates. 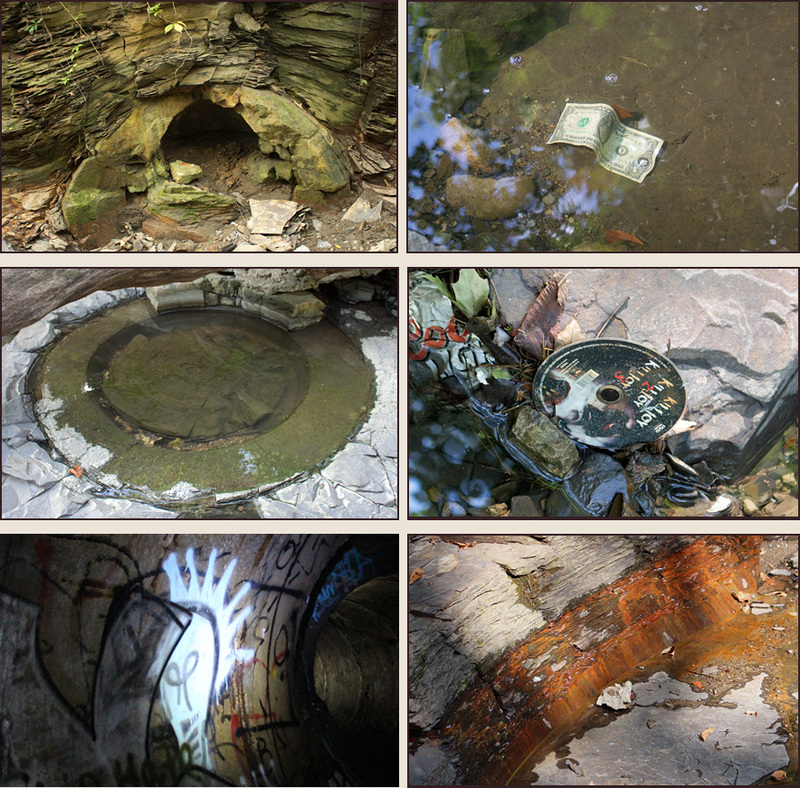 Even a casual observer can see many strange things in the ravine: money floating in the water, occult and horror paraphenalia, a 350-million-year old concretion that seems to have been burst open from the inside, perfectly circular "wells" made by no human hand, stones that seem to bleed, weird glyphs, sinister graffiti. Those who know about such things warn that these things are perhaps the most dangerous things in the ravine. Their creators and users do not leave them unattended. Magical traps await to snare those who meddle with things best left alone.